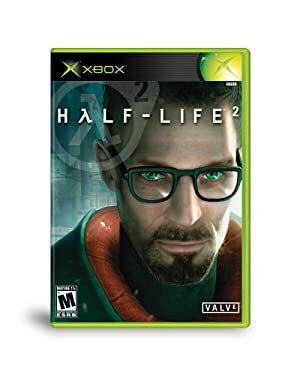 Released in 1998, HλLF-LIFE was a landmark First-Person Shooter video game, and Valve’s first game. With its scripted sequences and environmental story-telling, it brought narrative elements to the fore in a genre that had been trending toward 100% action. 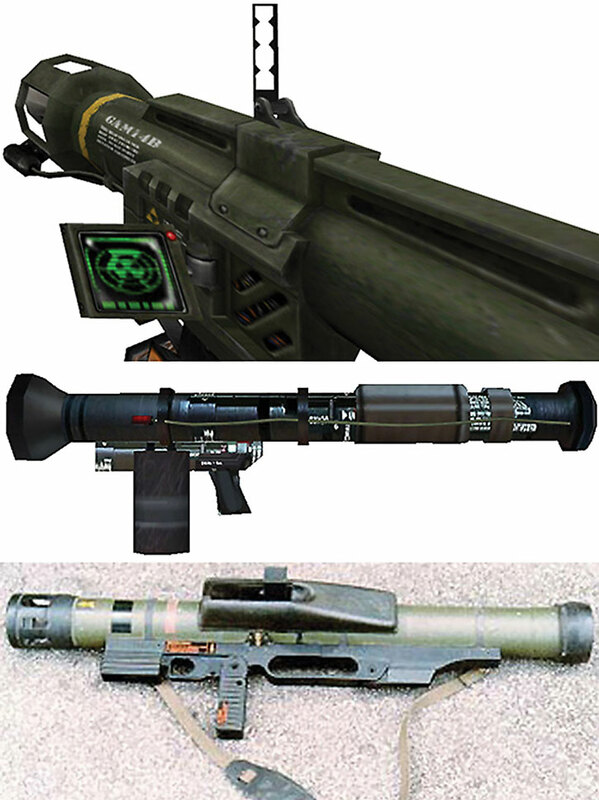 Since the game (and its expansions and sequel) is so famous and influential, its weapons are well-known. This article reviews them all, provides stats for both DCH and M&M, and goes into technical and tactical considerations about their in-game behaviour. 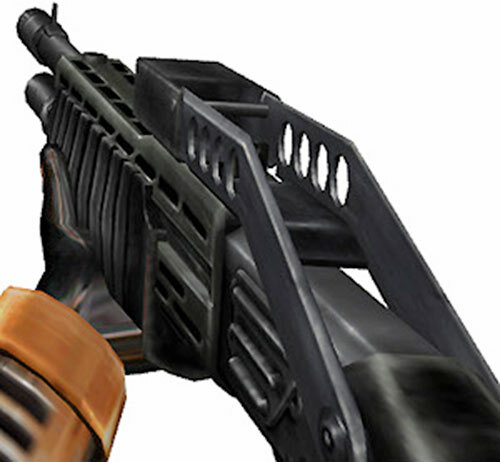 This article uses a few abbreviations to note which weapons appear in which game, but these should be obvious — HL1 is Half-Life 1, OF is the Opposing Forces extension, HL2 is Half-Life 2. See our Black Mesa Incident Report for the context and storyline if you haven’t played HL. Unless otherwise specified, all HL weapons have in DC Heroes terms the Lethal Limitation. Ye olde originale trailer for HλLF-LIFE, back in 1998 (and it shows). Damage Capacity can only be Recovered by recharging with a suitable power source (-2FC). Flash represents the suit’s spotlight, providing only forward Steady Illumination. First Aid only catalogues injuries the wearer has suffered to aid medical personnel in applying the appropriate treatments and thus can only be used to enhance others’ First Aid Skills like a Computer Ability (see pg. 178-9 of BoH:SE) (-1FC)]. 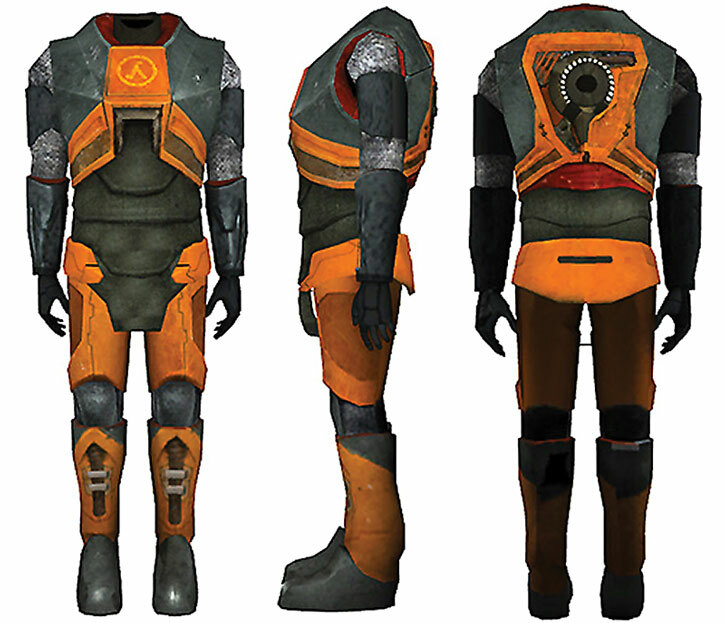 The HEV suit is commonly used by Black Mesa Facility personnel when they are entering potentially hazardous environments. It is not intended for long-term use in such environments, but rather as a temporary protective measure that lasts long enough for the wearer to extricate himself from danger if his environment suddenly becomes untenable (Sealed Systems). The HEV suit has various sensors giving the user feedback on current environmental conditions as well as his current medical status (Detect, First Aid). In addition to the protective properties of reinforced armor (/BODY/), the suit also uses a revolutionary new Magnetic Enforcement Generator System a.k.a. MEGS. This system reinforces the suit against damage by using magnetic fields to effectively boost the integrity of the suit (Damage Capacity). Rumors of the deleterious health effects associated with long-term MEGS exposure are so far unsubstantiated. DCH LONG-JUMP MODULE [BODY 02, Jumping: 02, Limitations: The Module can only be used by HEV Suit wearers (-2FC), Jumping requires the user to use an Automatic Action to run in the same round prior to Jumping (-1FC)]. The Long-Jump Module is another triumph from the Anamolous Physics Section. Using an Inertial Flywheel™ the LJ Module stores momentum and can release it in an amplified form, allowing wearers to leap much further than they would normally be capable of doing. To use the module, the wearer simply attaches it to the locking clamps on the back of the HEV, and then runs a short distance before leaping to get the appropriate boost. Partial Coverage (attackers can avoid the PCV with a +1 OV Trick Shot). Sealed Systems does not protect against a total lack of air — underwater, vacuum, etc. — but only against atmospheric contaminants as well as radiation]. The Powered Combat Vest is the standard body armor of the Hazardous Environments Combat (HECU) Close Quarters Battle troops. It is designed to protect the wearer against the environmental hazards he may encounter carrying out his mission as well as armoring him against physical attacks. This suit has a MEGS system similar to the HEV suit. DCH Crowbar [BODY 06, EV 03 (possibly more w/STR), STR 05 (Only to pry things open)]. M&M Crowbar [Strength-based Blunt Damage 2, Enhanced Strength 2 (Limited 2 to prying things open]. The first weapon you get your hands on. The crowbar does not have the Lethal Limitation, but may still be used for Killing Combat. The HλLF-LIFE crowbar became something of a video game icon, and ensured that many later games would sport a crowbar in their arsenal. DCH Combat knife [BODY 06, EV 03 (possibly more w/STR)]. M&M Combat Knife [Strength-Based Piercing Damage 1, Improved Critical 1]. This famous knife, made by KA-BAR Cutlery, has been the utility and fighting knife of the USMC and the US Navy since 1942. 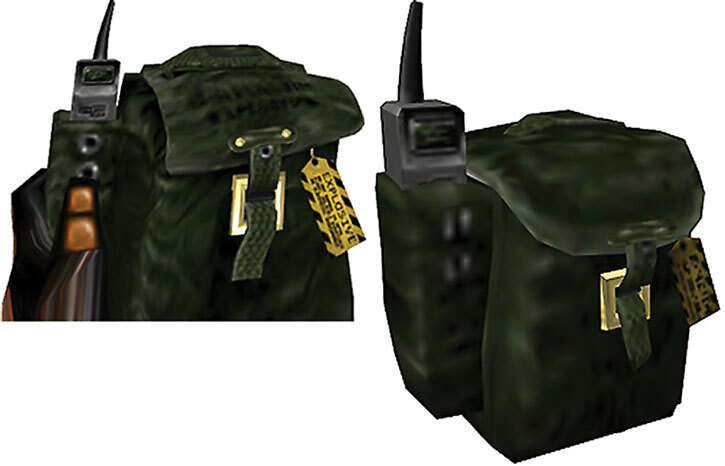 This is presumably the next gen model issued in 1995, which is more resistant to the elements and would logically be issued to HECU teams first. DCH Heavy Pipe Wrench [BODY 07, EV 04, possibly more w/STR)]. M&M Heavy Pipe Wrench [Strength-based Blunt Damage 2]. Like the crowbar, this may be an improvised weapon but its genuinely dangerous. The wrench does not have the Lethal Limitation, but may still be used for Killing Combat. All these weapons use Weaponry (Firearms). DCH Glock [BODY 03, Projectile weapon: 04, Ammo: 17, R#03]. M&M Glock [Ranged Ballistic Damage 3]. This pistol is accurate, but not very powerful. Its big advantage is the large magazine. 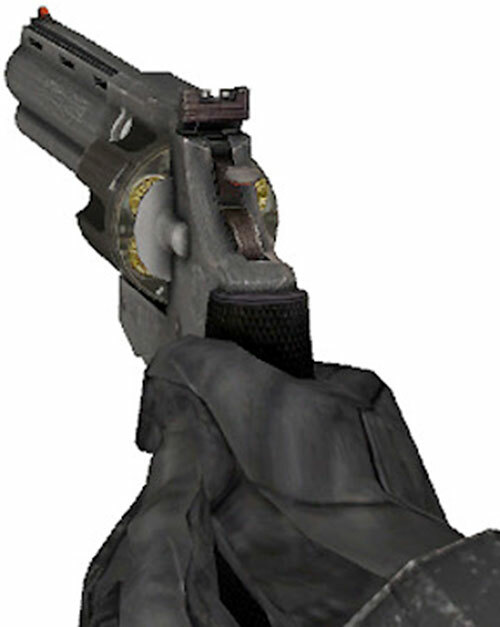 This sidearm was the most common pistol in security and law enforcement back then, and is thus logically found arming the Black Mesa security staff. DCH USP [BODY 03, Projectile weapon: 04, Ammo: 18, R#03]. M&M USP [Ranged Ballistic Damage 3]. 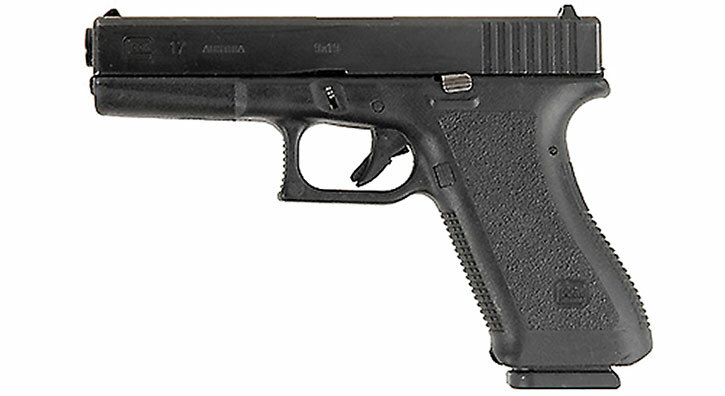 This 9mm pistol, not too different from the Glock, is the standard sidearm of the Combine. It is based on the USP Match variant, which sports a distinctive barrel weight/compensator for speed-shooting during competitions. Since this attachment looks mean and powerful, it has made the Match common sight in movies and video games. But in real life the basic model would be preferred over the target-shooting variant. DCH Magnum [BODY 03, Projectile weapons: 05, Ammo: 06, R#02, Rec. STR 02, Drawback: Long reload time, Misc. : -1CS to AV when attempting a Flailing Attack or a Multi-Attack due to recoil]. M&M Magnum [Ranged Ballistic Damage 4]. A high-quality, heavy revolver firing a powerful round. 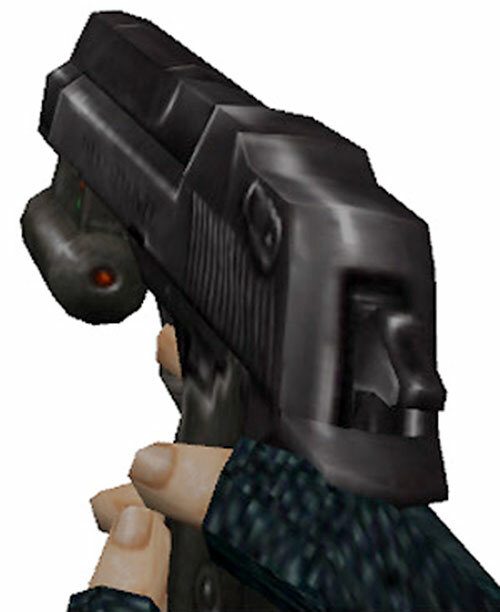 The Python is depicted with a heavy recoil (perhaps because Dr. Freeman is not trained to operate this sort of weaponry), making rapid fire inadvisable. One imagines that some guards at Black Mesa carried these as personal supplemental weapons, since revolvers do not have much of a role in modern security. 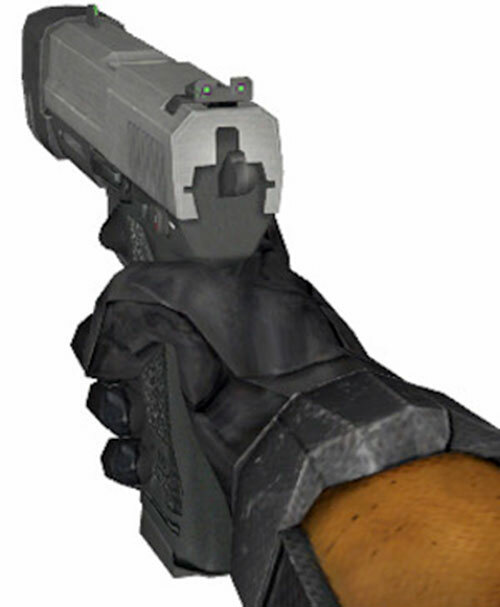 DCH Deagle [BODY 03, Projectile weapons: 05, Ammo: 07, R#03, Rec. STR 02, Drawback: Long reload time, Misc. : -1CS to AV when attempting a Flailing Attack or a Multi-Attack due to recoil]. 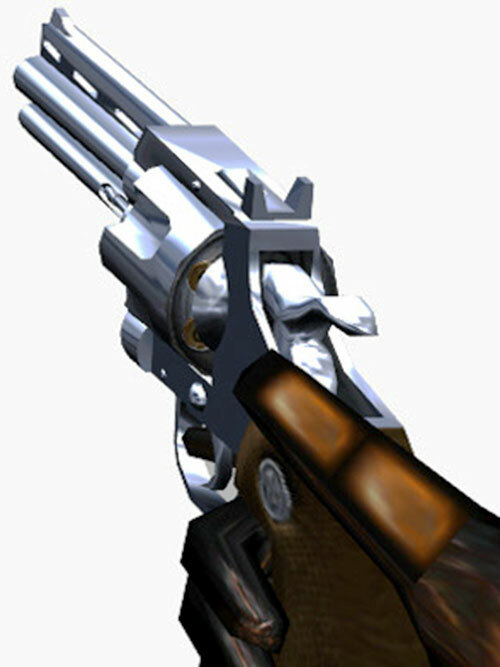 M&M Deagle [Ranged Ballistic Damage 4]. A high-quality, heavy semi-automatic pistol firing a powerful round. These are featured in the game with a 7-round clip (which is odd since real-life .357 Desert Eagle hold 9 rounds). 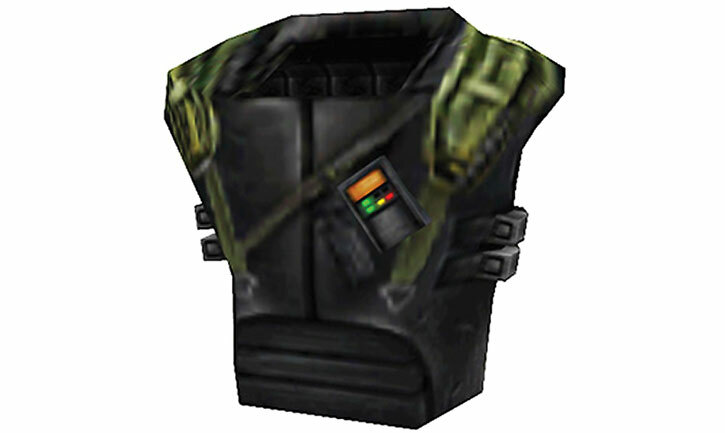 At least one Black Mesa guard (Otis) carried one to supplement his Glock. The Eagles used by HECU sport a LAM (Laser Aiming Module), though as per our usual conventions this has no in-game effect. The Eagle is carried by HECU troops and operatives. This is a very unusual choice as a service sidearm. The Desert Eagle is a large, specialised handgun and doesn’t equip any military of police force in the real world. A possible hypothesis is that the HECU is expected to deploy in very cramped surroundings (say, submarines) where the bulk of the fighting can only be conducted using handguns. If so a semi-auto with a powerful round might make sense. And perhaps the lowered ammunition capacity of the gun in Half-Life results from adaptations to military service, to make the gun easier to handle for shooters who do not have large hands ? Here’s a lot of shooting in HL1, specifically the Black Mesa remaster. All these weapons use Weaponry (Firearms) except the Crossbow that uses Weaponry (Missile). DCH Crossbow [BODY 03, EV 07, Range: 05, Ammo: 05, Telescopic Vision: 04, R#03, Advantage: Scattershot]. M&M Crossbow [Ranged Piercing Damage 6 Limited 1 (One-shot), Senses 1 (Extended Visual)]. A marvel of modern engineering, the HλLF-LIFE crossbow bolt is a truly deadly creation. The crossbow itself is silent and extremely accurate, with a built-in telescopic sight. The bolts are tipped with shaped explosive charges that can blow through a brick wall or obliterate a human target. 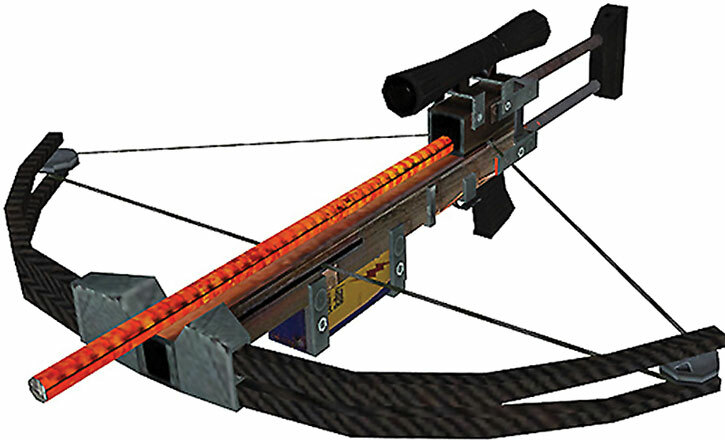 The explosive bolts sniper crossbow might be an Aperture Science design – especially the explosive giving the bolt such power. As this article majestically unfolds, we’ll run into other examples of impossibly compact explosive projectiles, for which we’ll also blame Aperture. And the science gets done, and you make a neat gun, for the people who are still alive. 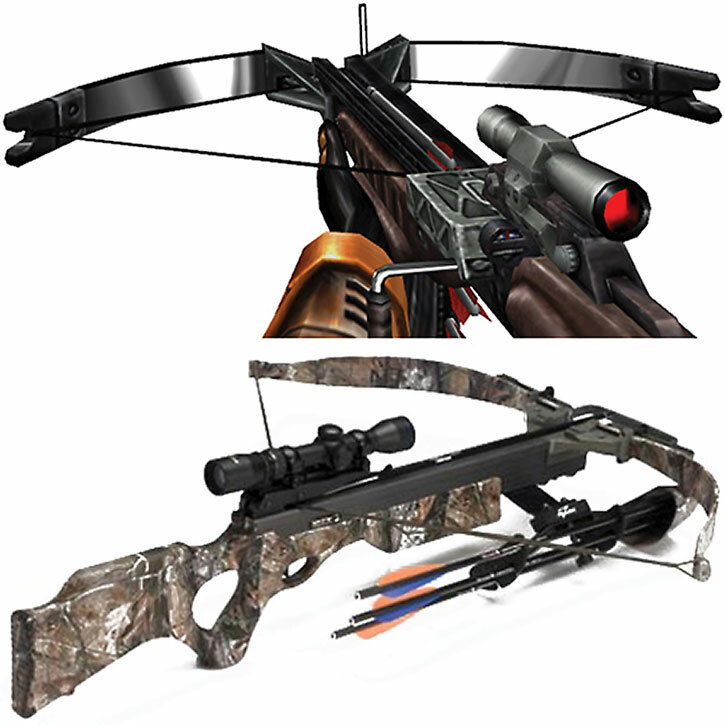 The crossbow is a basic hunting, scoped modern crossbow – what makes it special is the explosive bolt. The picture below the screenshot is an Excalibur Ibex, which looks more or less like the crossbow in Half-Life 1, since the Half-Life model is… odd. DCH Shotgun [BODY 04, Shotgun blast (Range: 03): 06, Ammo: 08, R#03, Recommended STR: 02, Drawback: Very long reload time, Note : EV can be raised to 07 Diminishing by shooting both barrels at once, expending two Ammo, increasing Recommended STR to 03 and lowering AV by 1 CS]. M&M Shotgun [Shotgun Blast 5, Power Attack]. The version of the weapon used by the Combine only held 6 shots instead of 8. 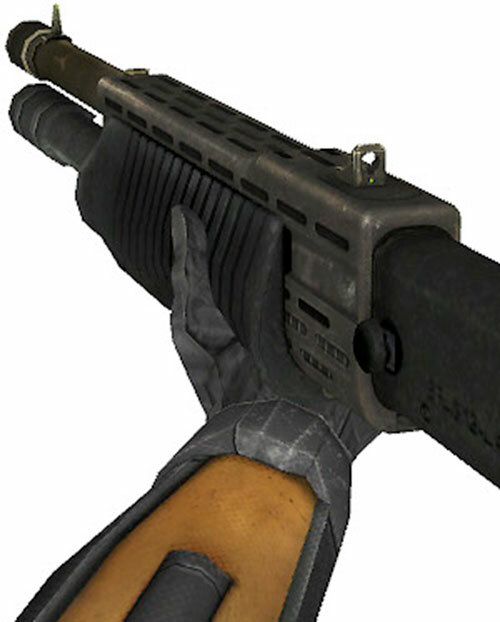 This weapon is outwardly based on the SPAS-12 combat shotgun. It is a powerful-looking semi-automatic design with backup pump action, and appears to fire 00 Magnum buckshot. However, it also has the strange ability to fire two shots at once – a powerful strike, though the kick makes the shot less accurate than more measured attacks. 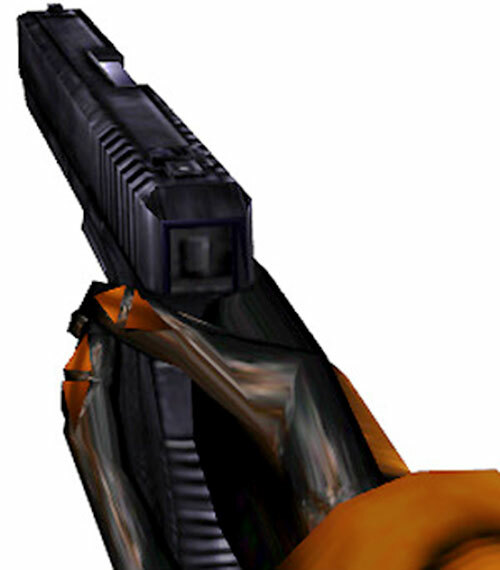 The Half-Life manual mentions that the alternative fire mode discharges “both barrels at once”. It thus seems likely that the tubular ammunition magazine running under the barrel was thought to be a second barrel, like in double-barrelled over-under hunting shotgun. It is vaguely possible that this shotgun is indeed a over-under design, with two triggers that can be pulled at once if needed. Which would imply that the action reloads two chambers at once, presumably from a box magazine like the one used by the SPAS-15, at which point things get really complicated. A simpler explanation is that it is a special design not unlike the H&K CAWS. That is it reuses the body of another gun (like the CAWS looked like a G11) and a box-fed semi-auto action, and it experiments with a burst mode. The idea was probably to have a high-cyclic rate two-rounds burst, with the second shell leaving the barrel before the recoil from the first can be felt. If so, it didn’t quite work, but it might have been considered to be literally close enough for government work. 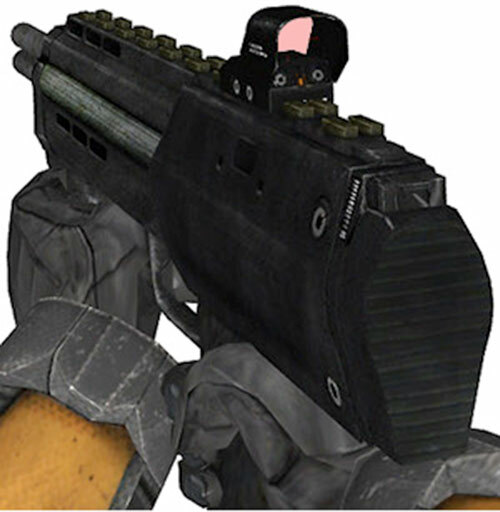 This weapon was used by Black Mesa guards (presumably kept at security stations much like police officers keep a shotgun in their cruiser) and some HECU marines. 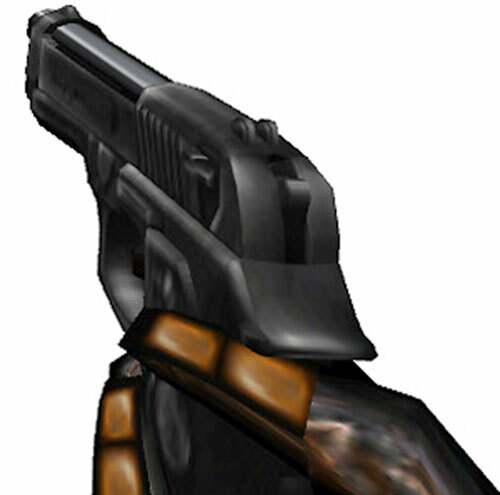 One may imagine that Italian gunsmaker Franchi was an entrant in the CAWS competition in the Half-Life/Portal universe, and actually got a small contract for a special-purpose weapon that caught the attention of the agencies running Black Mesa and the HECU. This may have been because the weapon used standard ammunition and pre-existing magazines, and that the buyers expected their troops to do close-quarter work against dangerous but unarmoured creatures. 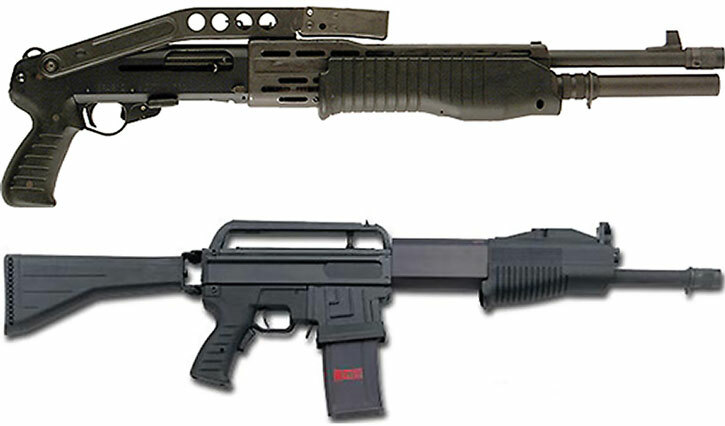 Below is a SPAS-12 (like the one in the game) and a SPAS-15 (which is what our hypothetical CAWS candidate weapon would look like, explaining the in-game characteristics). DCH Submachinegun [BODY 04, Projectile weapons: 05, Range: 03, Ammo: 07, R#02, Advantage : Autofire, Limitations: Projectile weapons has No Range, use the listed Range instead] w/Grenade Launcher [BODY 02, Range: 04, Ammo: 10, Drawback: Very Long Reload time] and HE grenades (x10) [BODY 01, EV 07 Area of effect 1 AP, Grenade Drawback] for the launcher. M&M Submachinegun [Array. The first application is Ranged Multiattack Ballistic Damage 4, Diminished Range 1 and the second application is Ranged Burst Area Explosive Damage 6, Diminished Range 1]. The Heckler & Kock MP-5 is the standard high-quality submachinegun – a compact weapon delivering accurate selective fire. This specific weapon is fitted with an unusual accessory among the many gadgets made for it – a grenade launcher mounted under the barrel. This is not commonly done, though solutions such as the M203PI with a MP5 adapter exist. The characteristics of this one — particularly the size and range — are more reminiscent of the Istec ISL 201 launcher from the UK. The HλLF-LIFE launcher holds an impossible 10 rounds, which no real-world launcher does unless it’s a large revolver-action contraption, and is never seen being reloaded. Since the writeups.org crew will never give you up — nor will it let you down, or even think about running around and deserting you — this can be explained. The technology might be the same as with the explosive bolts for the crossbow, where we previously postulated was a product of Aperture Science. If so, it’s not a grenade launcher at all. It’s an underbarrel module with a block of 10 barrels each housing a slim explosive, fin-stabilised dart, propelled over a short range by electrically-detonated caps at their base. Such an hypothetical module functions very much like a H&K P11 underwater operations pistol – once empty you remove the entire block (which is now just hard plastic with 10 tubes bored in it and smelling of burnt explosive) and insert a fresh one. The combination would make for a potent firearm — the Half-Life MP5+UGL is indeed a good weapon — to engage numerous soft targets at 15-30m. Between the weird shotguns and this, one gets the impression that Black Mesa was *expecting* to have to engage large, unarmoured aliens indoors in high-intensity fighting. HλLF-LIFE SMGs are curiously inaccurate at range due to ammunition spread, however (whereas the closed bolt used by the real life MP5 makes it very precise). On the other hand, the HλLF-LIFE MP5 sports an impossible 50 rounds. The projectiles from the “grenade launcher” explode at any range. There’s no safety range beyond which the projectile goes live, it can explode 10 inches from the barrel if it his something hard. Aperture Science – we do what we must, because we can. Here’s a rare picture of a MP5 with an underbarrel ISL 201. The barrel of the launcher pivots either to the right or left for reloading. DCH Submachinegun [BODY 04, Projectile weapons: 05, Range: 03, Ammo: 05, R#02, Advantage : Autofire, Limitations: Projectile weapons has No Range, use the listed Range instead] w/Grenade Launcher [BODY 02, Range: 04, Ammo: 03, Drawback: Very Long Reload time] and HE grenades (x3) [BODY 01, EV 07 Area of effect 1 AP, Grenade Drawback] for the launcher. This personal defence weapon is in common service with both the Combine and the Resistance. It looks very much like prototypes of the real world Heckler & Koch MP-7 PDW, but the performance of the ammunition is at best similar to that of the older H&K MP5 above – thought the magazine is larger, at 45 rounds. 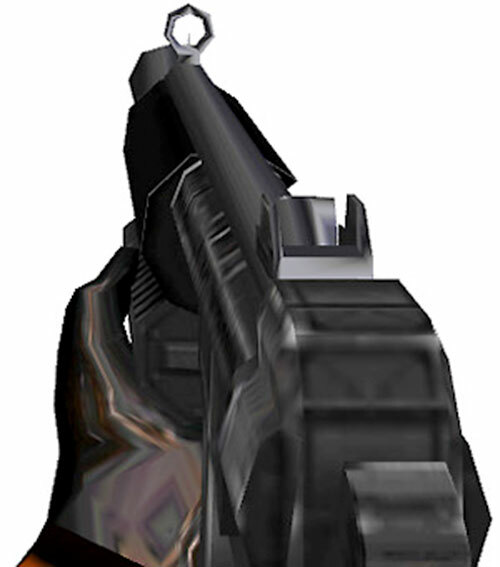 Like the MP5, the MP7 incorporates a grenade launcher, which is visibly impossible. This underbarrel GL holds 3 rounds, but no attachment is visible on the gun – though a second barrel has been slapped onto the (oddly proportioned) world model. 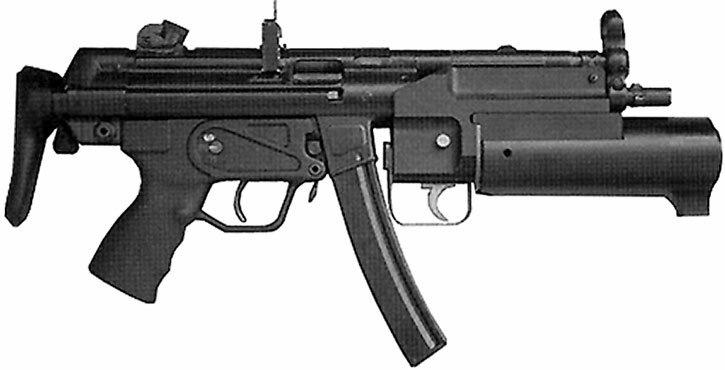 We’ll suggest that it is the same technology used for the “grenade” launcher of the MP5 above. Perhaps the lower ammunition capacity was intended to keep costs down, and to dramatically reduce manufacturing costs. And if it’s indeed an Aperture Science product, perhaps the earlier 10-shot models had a slight issue with spontaneous detonation under certain specific circumstances – such as the presence of gravity, being in an atmosphere, or being subjected to harsh language. Below is a mockup of a prototype H&K MP-7 similar to the one used for the view model in HL2, with the same Istec ISL201 grenade launcher as before. Combining the two is impossible in the real world without lots of machining – and you probably can’t find either weapon anyway. 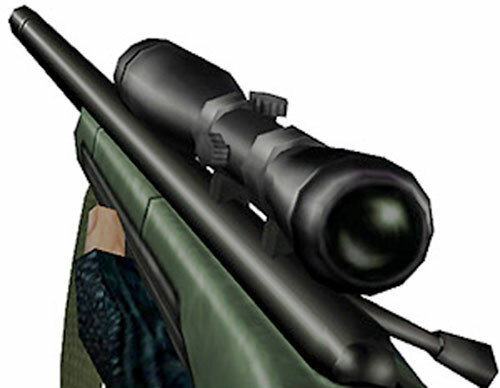 DCH Sniper rifle [BODY 01, Projectile weapon: 06, Range: 08, Telescopic vision: 04, Ammo: 05, R#02. Limitation: Projectile weapon has No Range – use the Range given next instead, Drawback: User must spend an Automatic Action to ready the next round using the bolt]. M&M Sniper Rifle [Ranged Ballistic Damage 5, Improved Range 1, Improved Critical 1, Senses 1 (Extended visual 1), Quirk (Bolt action – user must expand a Move Action to ready a new round)]. The standard sniping weapon of the USMC, used by HECU troops to secure open spaces. The M40A1 is familiar to many Americans who have hunted large animals, since it’s essentially a Remington 700 – a common bolt-action hunting rifle. They shoot the usual 7.62x51mm NATO round, and come with a standard telescopic scope adjustable up to 12x. While the Scout-Sniper’s favourite rifle is a solid choice, it doesn’t feel very appropriate to the HECU’s mission. A semi-auto rifle with a faster action to take .338 Lapua Magnum (say, a Vigilance VR1), or a Barrett Special Application rifle would do a better job if the idea is to help secure a zone with hostile alien critters. The HECU obviously has the budget to arm itself with non-USMC-standard firepower. So see the relevant Weapons Locker Modern Firearms article for high-powered rifles and anti-materiel rifles. These weapons can be operated using Weaponry (Heavy weapons) though the M249 can also be operated using Weaponry (Infantry weapons) and variants. DCH Light Machinegun [BODY 04, Projectile weapons: 07, Ammo: 06, R#03, Recommended STR 03 (none when using a bipod and the Bracing Bonus), Advantage: Autofire, Drawback: Long reload time, MPR (heavy and cumbersome (cutting movement speed by 1) unless your STR is 2 APs above the Rec. STR)]. M&M LMG [Ranged Multiattack Ballistic Damage 6, Takedown 1, Quirk 2 (heavy and cumbersome (cutting movement speed by 1) unless your STR is 4+)]. 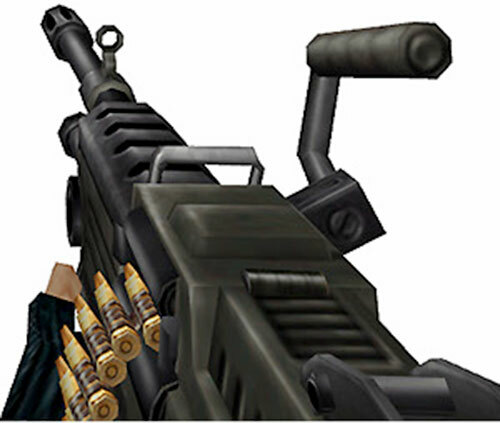 Though the model used is that of the M249 5.56mm Squad Automatic Weapon, the in-game characteristics are that of a heavier machinegun such as a M60. The damage is high, it carries much less ammunition than a M249 usually does, the guide calls it a “heavy machinegun” and it is depicted as having cinematic recoil (pushing the operator backward !). The stats above assume that it’s a 7.62mm light machinegun rather than as a SAW, to reflect in-game performance. The HECU presumably uses this not as a traditional infantry LMG, but as a close support assault weapon. This means a powerful machinegun that can be carried at the same pace than an assault rifle by a very strong and fit soldier and blow bigger holes than standard rifles. The reduced ammo capacity might not be much of a problem if the machinegunners are not here to provide suppression fire but to light up bigger and tougher aliens at a close range with a bigger round. 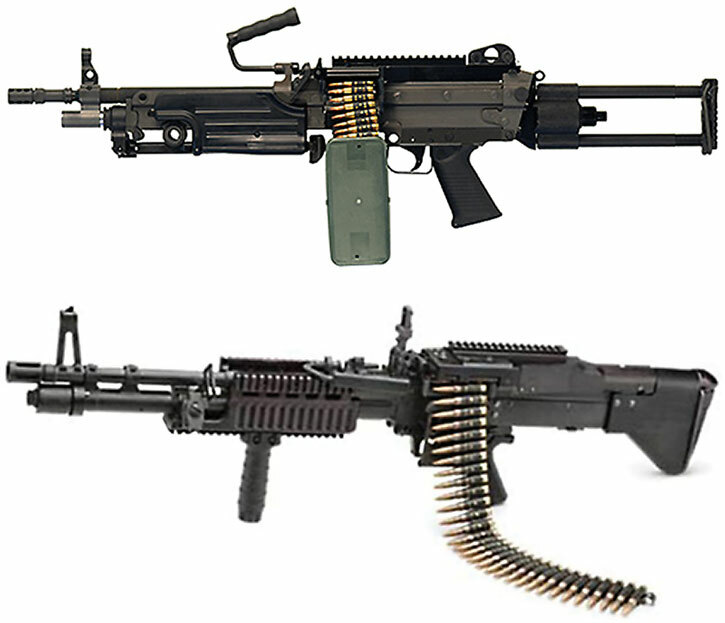 Below are a M249 SAW Paratrooper variant (close to what is depicted) and a M60E4 Mk43 (close to what the intent seems to have been, and to the in-game characteristics). DCH Armbrust-style launcher [BODY 01, Bomb: 04, Projectile Weapons: 09, Ammo: 01, Bonus: Projectile weapons and Bomb can be Combined (Bomb rides the Range of Projectile weapons)]. M&M RPG [Ranged Damage 9, Burst Area Ranged 3, Takedown 1, Limited 1 (One-shot)]. Though it is modelled after an Armbrust 67mm ATW, this is near-future weapon with a reloadable launcher and laser guidance. The operator can illuminate the target with a laser built into the launcher, and the rocket will probably hit the illuminated point. While both features are clearly advantageous in real life, they don’t quite have an in-game effect, since the penalties to hit that the laser would moderate do not exist in DCA or DCH barring a on-the-fly GM decision. The rocket in the game in slower than in real life (the real one does 200 metres/second). The Armbrust is famously one of the launchers that do not emit a fiery, thunderous backblast and shockwave when fire. There’s a mass of plastic flakes that serves as a counter to the force exerted by the rocket as it is ejected from the launcher by a piston and starts its engine. As such it can be fired indoors, though firing it from a vehicle is probably pushing it. DCH Frag grenade [BODY 01, EV 07 (Area of effect 1 AP), Grenade drawback, R#03]. M&M Frag grenade [Burst-Area Explosive Damage 5]. A standard hand grenade with a 5-second fuse. It must be thrown to its target (Weapons (Missile) Skill). These weapons are depicted as Mk2 “pineapple” grenades, which have been out of general use for decades but have an iconic look. DCH Demolition charge [BODY 01, EV (Diminishing Area of effect 2 APs): 09, Radio Communication (Receive Only, Scrambled, Limited to a specific signal): 01, R#03, Grenade Drawback] with Satchel Charge Detonator [BODY 02, Radio Communication (Transmit Only, Scrambled, Limited to a specific signal): 02, R#02]. M&M Satchel Charge [Burst-Area Explosive Damage 9, Feature 1 (Remote detonator)]. The satchel charge is meant to be used for demolition purposes, although it can be used as an improvised tactical weapon in a pinch (“throw n’ blow”). Satchel charges look like large square canvas pouches with an antenna protruding from them. 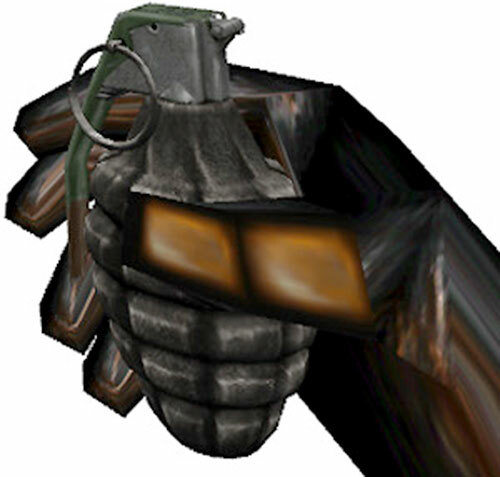 The demo pack is placed (or thrown: -1 CS to AV because of awkward design) in place, then remotely triggered by use of the detonator. Note that multiple charges can be set and then detonated simultaneously. 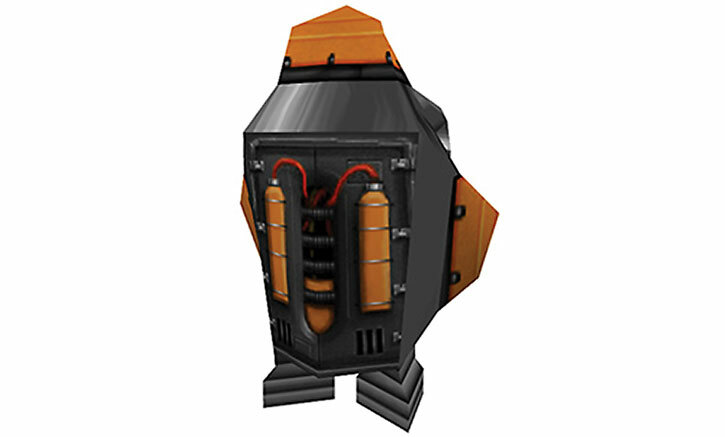 DCH Sticky mine [BODY 02, EV (Diminishing Area of effect 2 APs): 08, Ammo: 01, Cling: 01, Miniaturization: 04, Ultra Vision: 02, Limitation: Shrinking is Always On and Already Factored In, R#03]. The trip mine cannot be used as an offensive weapon, but must be set in place. 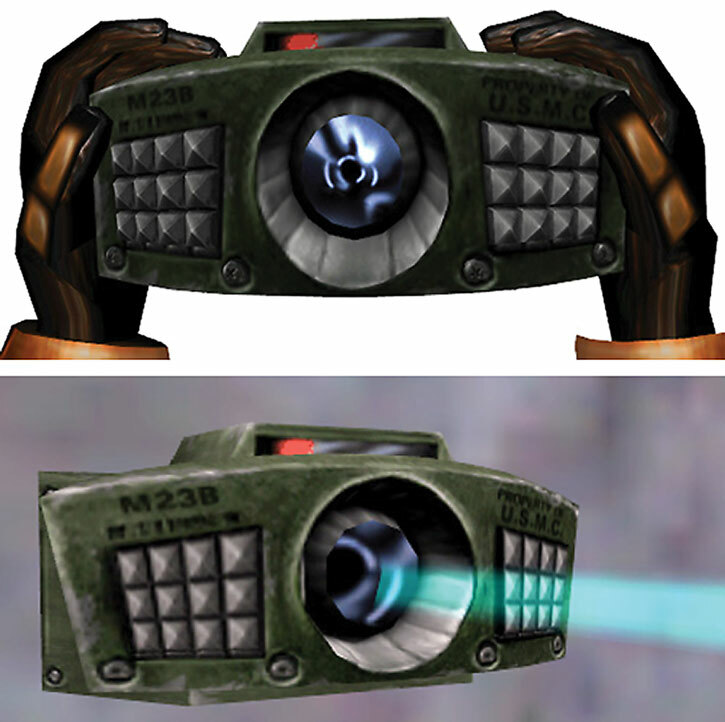 Trip mines are small rectangular metal boxes with a lens on one side. Anyone with any APs of Military Science (Demolitions) is assumed to be able to use them. They can also explain their use to someone without Military Science in about 5 minutes. They are designed to be rapidly placed and can be set is a single Phase by expending one Automatic Action and one Dice Action. No Dice Roll is generally needed (GM’s call). The trip mine can be placed on most any flat surface at any orientation. Once placed, the trip mine emits a laser beam (Ultra Vision). If anything crosses the beam, the trip mine explodes. The trip mine is designed to do most damage in a 180-degree arc away from whatever it’s attached to. Items behind the trip mine (usually a wall) are affected by an EV (Area of Effect 0 APs) of 06 rather than the EV listed above. Visual detection using the APs of Shrinking as the OV/RV against Perception Checks. Ultra Vision making it easy to see the blue beam emanating from the mine. All these weapons use Weaponry (Exotic). They also all use the same radioactive batteries for ammo. Each battery is equivalent to 5 ammo charges for the Displacer Gun, 20 for the Gauss Gun, and 10 for the Gluon Gun. Dimension Travel only works between Earth and Xen (Travel Distance 06/06). Travel Subpower has No Range (it only affects the gun and its user) and uses 3 ammo charges. Banishment inflicts a Physical Attack against the target’s BODY (no modifiers for Growth, Skin Armor, etc.) as well as any other object within 1 AP of the target (though this collateral damage does not dimesionally-displace the affected objects), it takes 1 round after the trigger is pulled for the chosen effect to activate]. 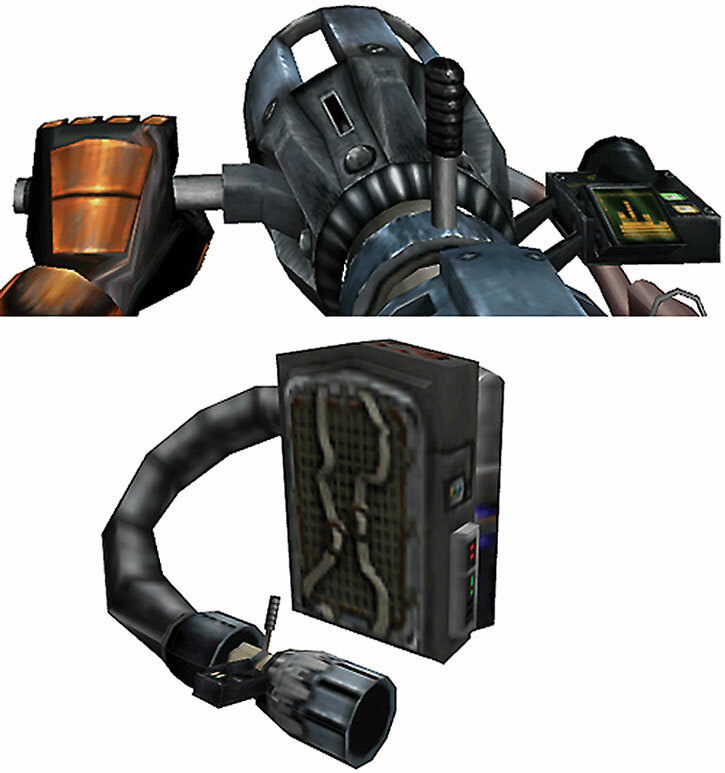 The displacer gun looks like a high-tech personal generator with a pistol handle attached to it. The d-gun generates a green glowing sphere with an orange-colored corona ; this sphere can be generated around the gun and user or fired at distant targets. When the sphere encounters a physical object, it triggers Dimension Travel as described above. The gauss gun is a painfully obvious experimental weapon. 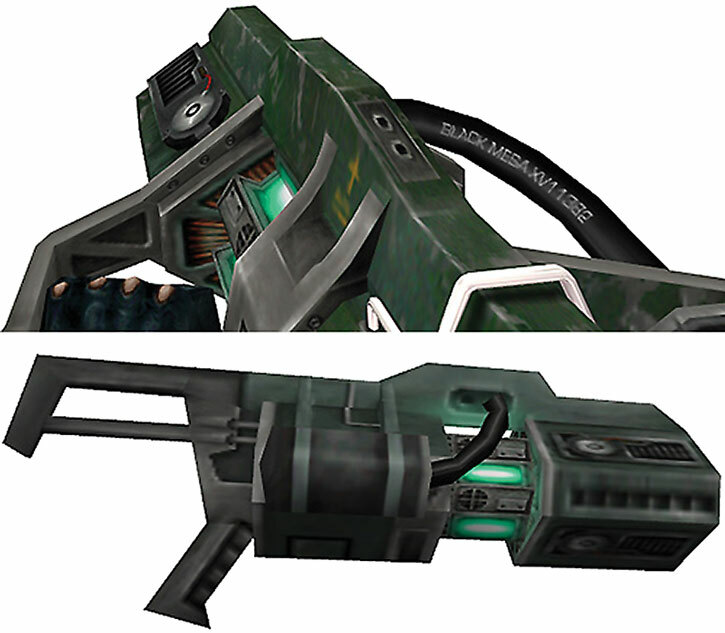 It is a vaguely gun-like object with wiring and circuitry simply attached where ever it can be with no complete casing. This experimental, highly unstable, weapon has two fire modes. The first is automatic fire and uses the first set of stats (AV: 4, EV: 6, Range: 4). It is useful for obliterating tough foes at close and medium range. The second fire mode requires charging the gauss gun (Expends one Dice Action) and then firing (must be the next Dice Action). It uses the second set of stats (no AV, EV: 9, Range: 6) and uses 2 ammo charges. This fire mode is useful against extremely-tough opponents and vehicles. If a natural 2 is rolled using the secondary fire mode (or if it is charged for more than one action), it will explode with Bomb: 05, blast radius: 0 (10‘). DCH Gluon gun [BODY 04, Energy blast: 07, Ammo: 10, R#03, Advantage : Autofire]. Another prototype energy weapon, the gluon gun emits a constant stream of energy that disintegrates anything in its path. 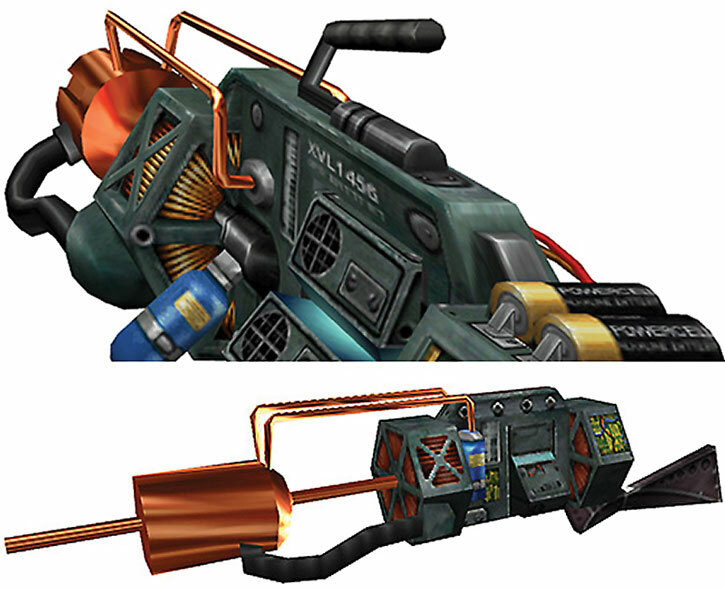 The gluon gun consists of a backpack generator with a hose and nozzle coming out the bottom for the user to direct the energy stream like a firehose (“Don’t cross the streams !”). All these weapons use Weaponry (Exotic). DCH Barnacle [BODY 02 STR 04, Claws: 06, Stretching: 03, Limitations: Stretching can only be used to Grapple an object and pull it to the barnacle’s mouth (Claws) or draw the user toward the object if it is firmly secured in its location (velocity: 3 minus weight APs), barnacle will only Grapple organic objects]. This is a smaller, immature version of the barnacles plaguing the ceilings of the Black Mesa Research Facility in the wake of the Xen incursion. They look like small (2’) fleshy kegs with a jaggedly-toothed orifice on one end. Barnacles can extend a large grey tongue from their mouths to grapple objects for feeding. Since this barnacle is not secured to a surface, it may instead draw the user toward its grappled target, if that target is firmly secured, allowing it to act as a living grappling-hook. Use is fairly simple — squeeze the barnacle and wait for the tongue to hit something (attacks use the firer’s DEX or Weaponry (Exotic) skill for the AV). 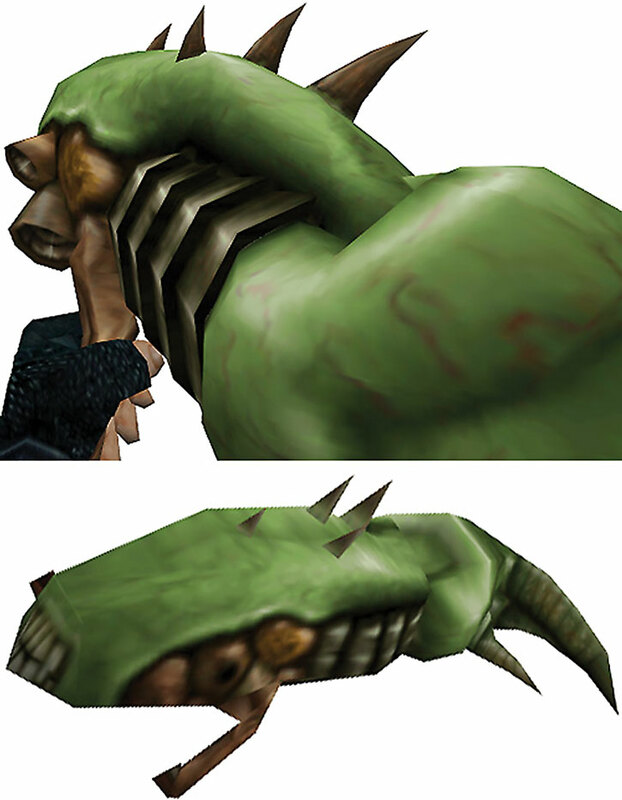 Note that the barnacle will only grip organic items, making its use as a living grappling-gun very limited, except in Xen or the Black Mesa Research Facility (which had numerous organic extra-dimensional spore/fungal infestations upon its walls and ceilings). DCH HORNET GUN a.k.a. HIVEHAND [BODY 05, AV 05, EV 05, Range: 05. Bonus: Can be used for indirect fire. When used in this way, use the hivehand’s AV: 05]. 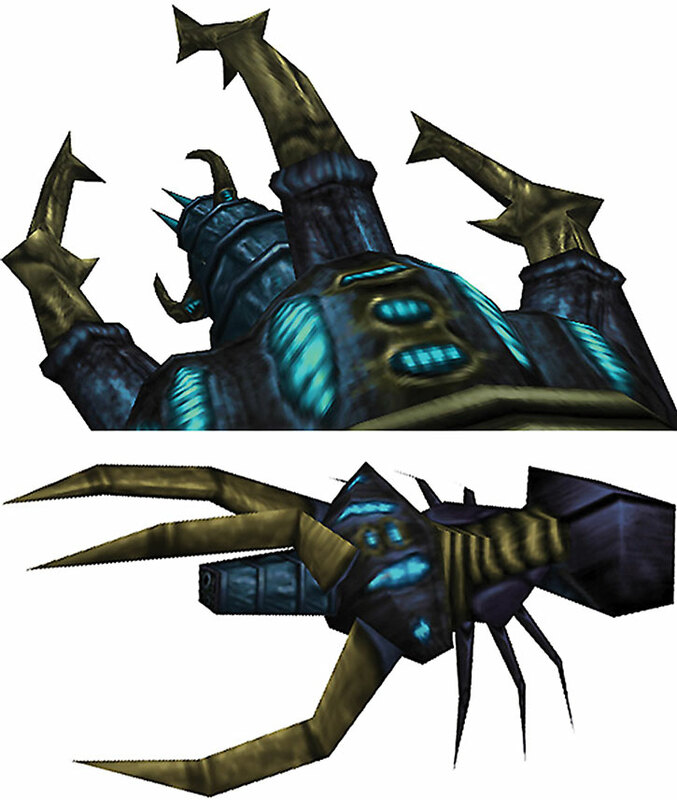 The hivehand is a living weapon that fits over the forearm. It constantly generates hornet-like creatures that the user can either fire directly at an opponent or “fire and forget,” letting the hornets attack any nearby target with a body temperature. DCH Snark Hive [BODY 03]. The snark hive can hold up to 5 snarks. Players unleashing snarks on living targets receive any applicable killing combat penalties. Snarks will automatically attack the first moving thing they see. That’s bad luck if there aren’t any targets in front of them when you unleash them, because they will then come after you. Bomb automatically activates 15 seconds (2 APs) after Snark is exposed to air. Use of Bomb destroys the Snark. Shrinking is Always On and reduces STR and weight (Snark OV against Physical Attacks is 12). Running takes into account effects of Shrinking. SPR (No Hands), Misc. (Nonsentient). DCH SHOCKROACH a.k.a. SHOCKRIFLE [BODY 02, Cling: 02, Lightning: 06, Telepathy: 0, Ammo: 10, Bonus: Ammo regenerates at a rate of 1 charge every two rounds, Limitations: Cling only allows the shockrifle to stay bonded to its host, Telepathy only allows the shockroach to receive its host’s “fire Lightning” and “release Cling” commands]. These weapons look a lot like large metallic-purple ants with three golden pincers. 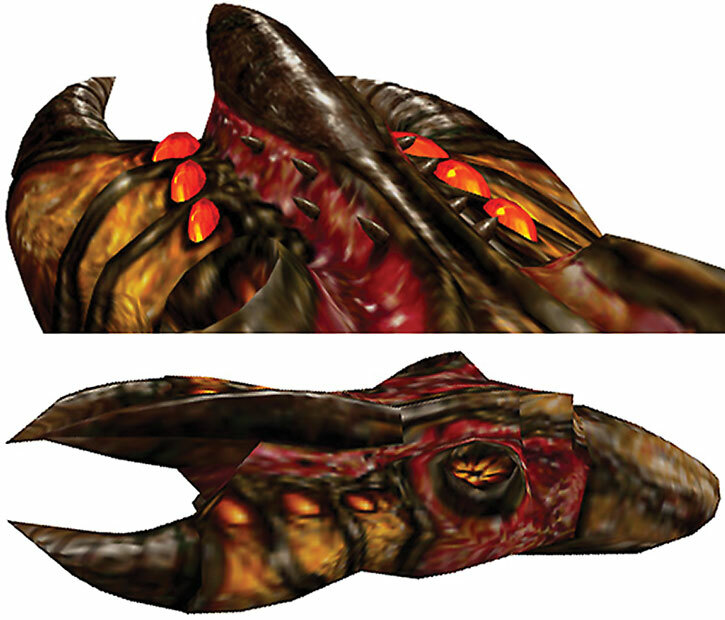 Shockroaches are initially encountered as shockrifles (with the above stats) used by Shocktroopers. When a Shocktrooper is killed, the shockroach (see the stats below) looks for a new host, as it will quickly die if it does not bond with another life form. Once bonded (by touching the host) the shockroach will harmlessly draw bioelectricity off of its host for sustenance (Vampirism). It will cling to its host, though it can be moved around to different bodily locations (arm, back, etc.) or even placed in a container so long as it remains within 0 APs of its host. If taken outside this distance, the bond is broken and the shockroach seeks out a new host immediately. Unbonded shockroaches that encounter hosts for another shockroach will attack that host, attempting to displace the host’s current shockroach. This strategy usually results in nothing more than the unbonded shockroach wasting its final moments. Shrinking is Always On and reduces STR and weight (Shockroach OV against Physical Attacks is 8) ; Running takes into account effects of Shrinking ; Vampirism inflicts no RAPs and is Always On, shockroaches die after 3 rounds if they do not have a host. 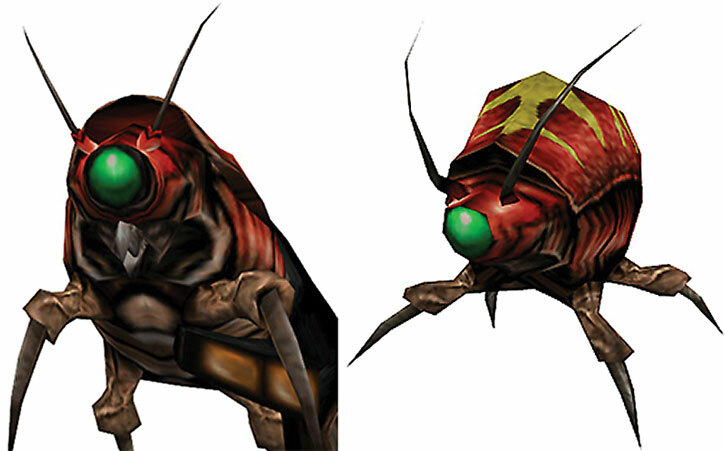 As mentioned above, the shockroaches only have Lightning and Telepathy when bonded with a host as a shockrifle. DCH Shocktrooper Larva [BODY 03, Bomb: 08, Ammo: 05, Bonus: Bomb can be fired indirectly (ricochet), Limitations: Bomb is fired like a projectile (AV=DEX), only has a Blast Radius of 1 AP, and only detonates if it hits an organic object or if 1 AP has passed since it was fired]. This bioweapon looks like a large green tadpole and is, in fact, a larval Shocktrooper. It is “loaded” by being fed spores (apple-sized flourescent-green globes) from Xen Spore Plants. Each spore takes 1 round to load. Spore plants are common in Xen and in the Black Mesa Research Facility. A spore plant looks like the bulb of a venus flytrap attached to a lichen on the wall or ceiling. Spore plants have a single spore in the bulb of the plant and when the spore is removed it takes the plant 2 APs to grow a new one. The spore plants are often found in clusters and are also useful for Barnacle users looking for organic material upon which to latch their Barnacle’s tongue (see Barnacle description above). By Mark A. Ayen, Roy Cowan and Sébastien Andrivet. 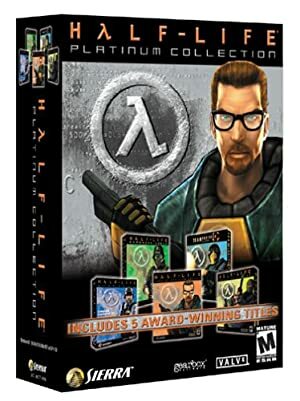 Reference materials: Half-Life Strategy Guide, www.planethalflife.com (defunct), imfdb.org , half-life.wikia.com . Helper(s): ’Lord‘ Rev. Dr. Paul Soth, Andrew J. Aitken. Most illustrations for v3 of this document are from imfdb.org and half-life.wikia.com.